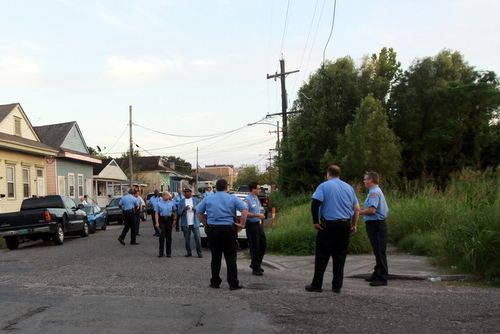 Less than two months ago, the weeds in the vacant lot the corner of Foucher and South Saratoga Street grew as high as the shoulders of the police officers who gathered there for an anti-crime march following the second of three fatal shootings there this year. Today, the overgrowth is gone, replaced by construction workers preparing the site for a collection of new homes that will be placed on the market early next year for approximately $2 million. 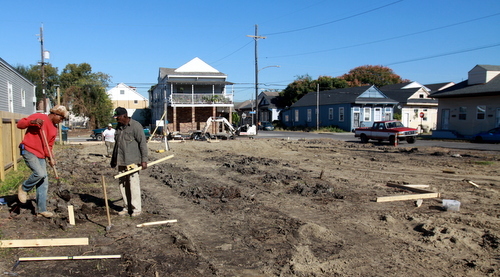 The developer of the property, Bo Pennington, and the long-suffering neighbors hope for an even more dramatic transformation: that of one of Uptown New Orleans’ most violent spots into a new nexus for neighborhood revitalization. The corner of Foucher and Saratoga has had an eventful life in recent years. In 2011, the ramshackle home there was at the top of the neighborhood’s list of neglected properties they feared were a danger to passers-by and a magnet for crime. The very night before the city was scheduled to tear it down on a “Fight the Blight Day,” however, the house collapsed on its own. After the debris was removed, the violence did not abate, however. This year alone, the corner has been within sight of three homicide investigations. Two women were killed and a third man injured in March; another man was killed and a passer-by injured in September; and a woman was found dead in a car that crashed at the corner earlier this month. Through it all, neighbors have pleaded with police for more enforcement, holding multiple events and anti-crime marches at the corner. They have also mobilized to engage the immediate neighbors as well, adding anti-crime cameras and organizing a recent health fair as a method of outreach. 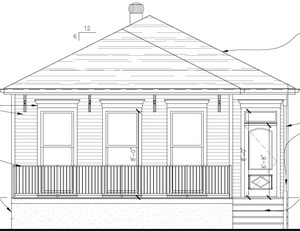 On Tuesday, less than two weeks after the most recent homicide, the Delachaise Neighborhood Association finally had a different topic to discuss: the beginning of the redevelopment of six houses surrounding the corner by Bo Pennington of Pentek Homes. The project will proceed in two phases, Pennington said. 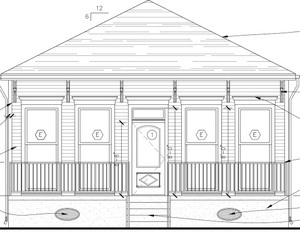 First, two homes will be built on the vacant lot, and two other homes on the other corners of the same intersection — the light-colored house 2039 Foucher and the blue house at 3523 South Saratoga — will be renovated and sold. The second phase will focus on two houses on the interior of the same 3600 block of South Saratoga, Pennington said. The first homes should be ready for sale by February, Pennington said. A flyer for the new houses being built on the lot asks $429,000 for each of them — 2,100 square feet, three bedrooms, 2.5 baths with off-street parking. The design will include numerous New Orleans elements, Pennington said, including floor-to-ceiling windows in the front. Another feature of the homes will be the extensive use of security cameras. Site work has just begun, Pennington said, but he is preparing to install four cameras pointed down each street of the intersection as soon as his second temporary power pole goes up. Those, he said, should bring an immediate reduction in the criminal activity that neighbors have long complained of around the intersection. Some neighbors wondered if the prices and the overall project are aspirational for a corner with such a checkered past, but Pennington said they are realistic. The average home sales in the 70115 ZIP Code, by comparison, are around $220 to $240 per square foot, while he is seeking closer to $200. The neighborhood is surrounded by traditional draws, such as St. Charles Avenue and the Mardi Gras parade route, as well as other up-and-coming areas, like the Freret and O.C. Haley corridors. The Delachaise neighbors have poured so much energy over the last year into addressing the violence at the corner that the news of such a major investment was met with enthusiasm. They spent months alone arranging for a security camera to be installed at the Other Place bar facing the streets — a project association officials announced has finally been completed — so the additional cameras alone are welcome. “To have someone come in and start and concentrate development right there, it’s really going to change this part of our neighborhood,” said Kimberly Hymel, who leads the association’s anti-blight task force. Now, Denton said, as the neighborhood bonds strengthen, the new construction at the troubled corner feels like a major symbol of movement in the right direction. I hope as the building progresses the city inspectors notice the deterioration of the surrounding area and issue summonses to the owners. One block away a house was razed and it is now a school bus parking lot. NOPD must have missed that on their crime walk.